25 years of Shiloh serving the Rotherham community, yes the two ladies who started Shiloh 25 years ago could never have dreamt that Shiloh would continue for 25 continuous years, supporting thousands of homeless and marginalised people with meals, clothing, support to find accommodation, access to a variety of essential drop in support services, and lots of care from a team of dedicated, trained volunteers. 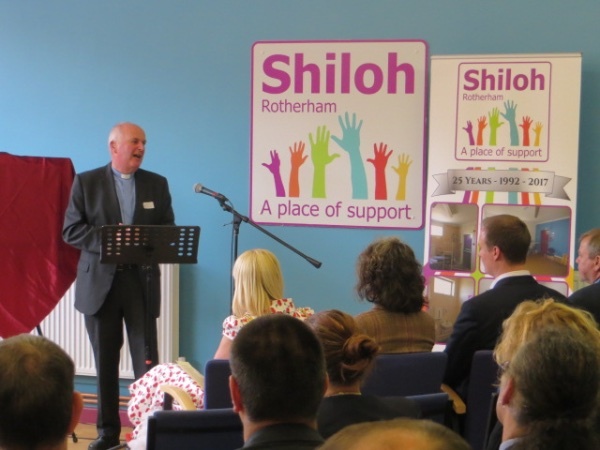 As they wandered around the town centre with just sandwiches and flasks in their backpacks to give to the homeless, could they have imagined that Shiloh 25 years later would be opening the doors of its superb specially converted building, now the Shiloh Station Road Centre, having been offered it with a 25 year lease on a peppercorn rent by Rotherham council. 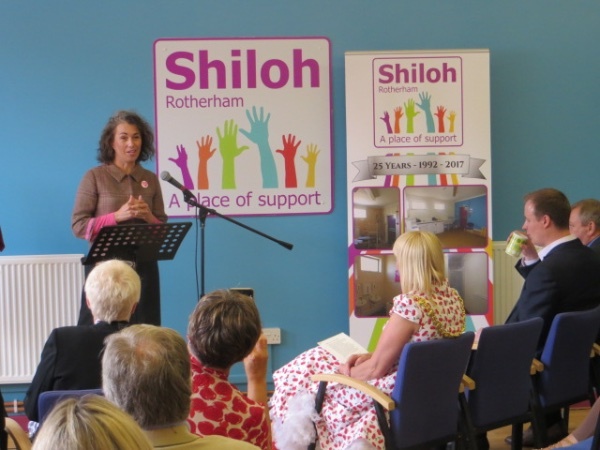 Without doubt Thursday 20th July 2017 must be Shiloh’s greatest day in history, when Shiloh celebrated its 25 year anniversary with the Official Opening of it’s new Station Road Centre by the Mayor of Rotherham Councillor Eve Rose Keenan. The event was preceded with a buffet and tour of the centre, the splendid buffet being provided by partners Fortum and Meers complemented by Asian finger-bites by charity Friends in Deed. The event got underway and John McDonnell, Shiloh’s Chairman welcomed Shiloh’s patron, MP Sarah Champion to speak, who passionately praised the work of Shiloh serving the community through all those 25 years , how it’s services had developed from providing simple sandwiches to hearty hot breakfasts and lunches, clothes, showers, laundry and even a hair salon, all aimed at helping the guests improve their well being. Then all the support services that come into a Shiloh each week to help guests work through housing, finance and health issues. There is no wonder that so many of the guests get their lives back on track again and become independent. Shiloh has done so much and developed beyond recognition, in these 25 years, certainly something to celebrate and to be proud about. 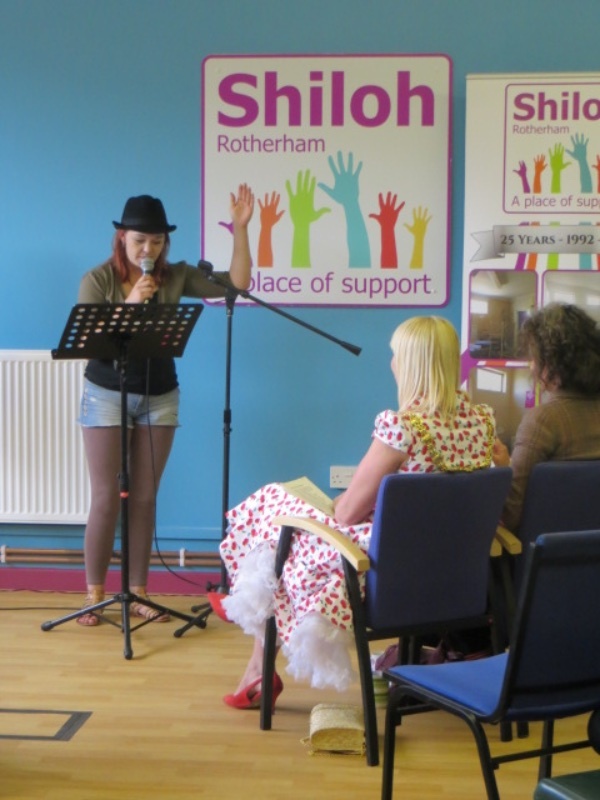 Sarah’s talk was followed by a young poet, formerly homeless who recited a couple of her poems. Her energetic yet poignant words spoke directly to the heart as she expressed just what thoughts go through the mind in difficult times. For the many invited guests this was a moving unforgettable moment. Hazel Stanley has now become the Mayor’s Poet in Residence at the Rotherham Town Hall. Leader of Rotherham council, Chris Read took the opportunity to explain to all how this unique partnership between the council and its partners allowed any surplus from their contracts to be reinvested in the Shiloh building project and together with the councils wide scope of experts and the partners, builders, electricians, plumbers and heating engineers, it became possible for the vision of a new Shiloh to become a reality. 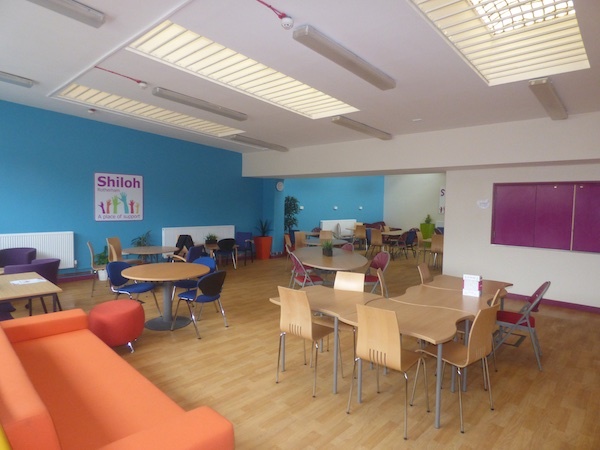 Chris was also pleased to to be able to say that once the building work started, it was finished on schedule, within budget and Shiloh was able to have a seamless move from the old to the new building without loss of meals for our guests – incredible. 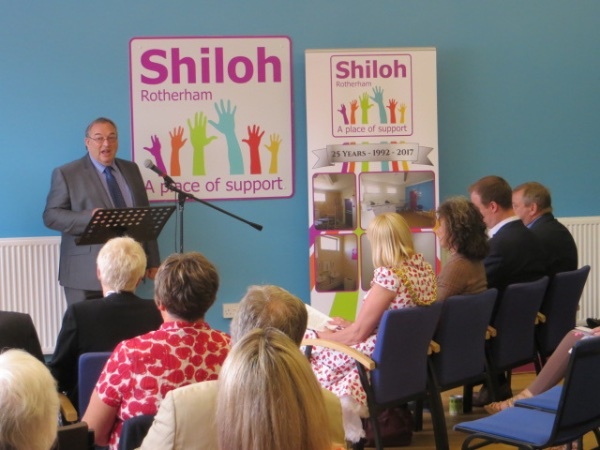 Then came the surprise announcement from chairman John McDonnell who had great pleasure in announcing that Shiloh, had been awarded a £250,000+ Reaching Communities grant from the Big Lottery, which would enable Shiloh to take on salaried management plus contribute towards the higher operating and development costs associated with the new premises. Spread over three years and ensuring financial stability into the future. 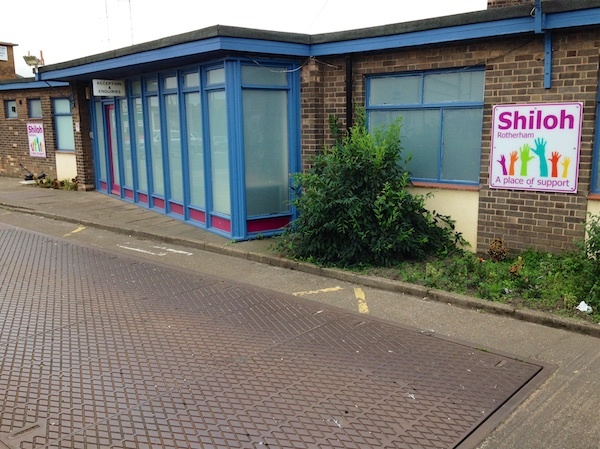 Shiloh is a Christian charity and throughout the 25 years has sought to maintain a simple but powerful ethos that as Jesus cared for those in need we can do the same. So it was most fitting that Rev. David Bliss recently retired, was invited to offer a blessing of thanks for God’s blessing of Shiloh throughout the 25 years and for the future and all that come through our doors. Prior to the unveiling of the commemorative plaque The Mayor of Rotherham Councillor Eve Rose Keenan, took the opportunity to focus on the immense and invaluable work of Shiloh’s volunteers saying “The heart and life blood of Shiloh are the volunteers, those that come in the early hours to open up and get the breakfast going, those that peel the spuds and butter the bread, those that wash the endless mugs and plates. Then there are those who welcome guests and those who befriend and carefully and patiently listen, those who sort out things for showers and laundry or fix guests with clean clothes or make them feel special with the latest hairdo. Shiloh volunteers do it all – for free”. 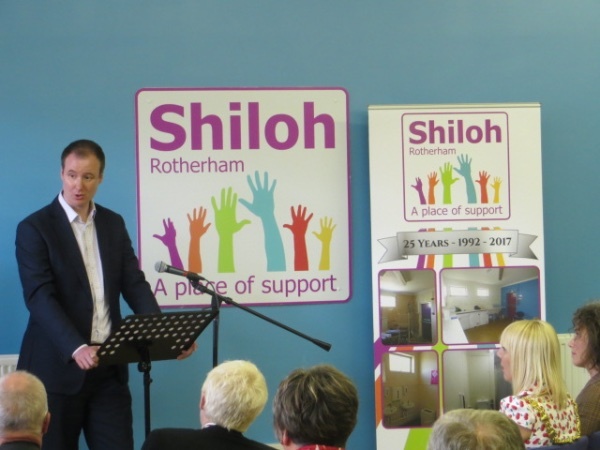 The Mayor, accompanied by her Consort then officially opened the Shiloh Station Road Centre by unveiling the plaque which commemorates 25 years of Shiloh serving the Rotherham community with the Official Opening of the Station Road Centre to the applause of all present.